It is so great for me to have some actual time to spend in the studio – I feel like I’ve been neglecting it recently with trying to balance work and everything else. A resolution is to document my MA time actively in a diary as I feel I need to acknowledge when I am doing MA related activities – this was prompted by my final exhibition proposal where Angela said I needed to include time for writing and editing. It takes me so long to read anything that I almost don’t acknowledge that this is valuable time committed to moving my ideas forwards. So I have managed 18 hours of making this week:)! My investigation explores pairs – pairing, reflection, repetition, spiting, merging, doppelganger, double take, stock characters so far. 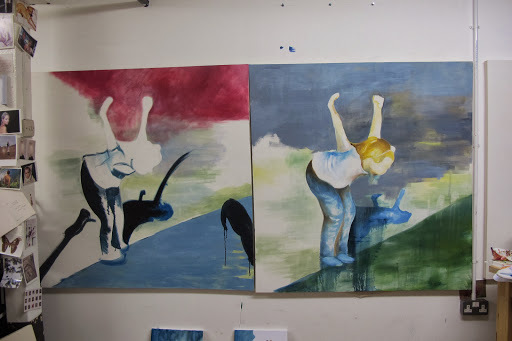 This first pair of paintings has been lurking for a while but I have managed to work into them alternately – an have obliterated much of the original green. Left hand figure was drawn from right – a mirror and copy. Parallels of diagonals and shadows to introduce multiple figures. Have reduced the setting to simple diagonals to create some context but not too pictorial. Thought I would try a darker, denser background for the right to reduce the amount of green again. 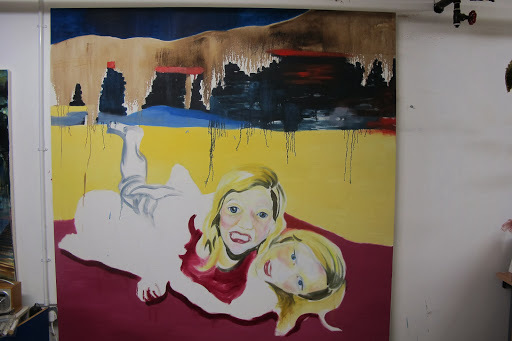 Allowing some of the under painting to come through but just a suggestion or trace. 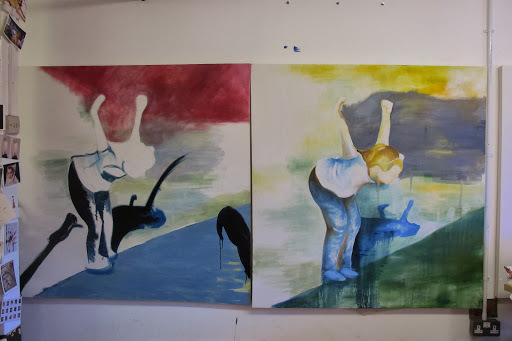 More of the grey – not sure whether to bring it down on the left fully, to fade out or just stop – perhaps unfinished is better to imply a further sense of instability. 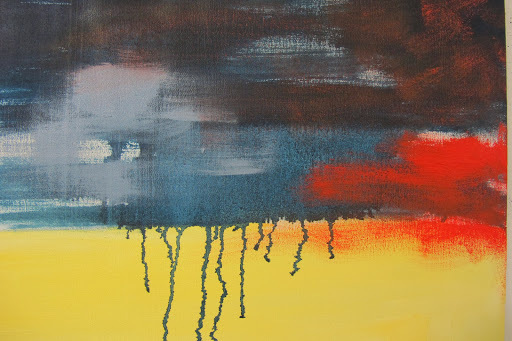 Made a decision to add mix of Prussian blue and brown together for white area – quite a contrast to before – not quite as dark as it appears due to thunderstorm outside. Worked around dripples with chisel brush to preserve some of the marks without layering – not sure if this works yet…Added quick crimson line for shadow – gestural rather than blended. Starting to think about addressing the bodies – want to loose some of the individual definition as though they are merging together. I love the leg drawing – might leave it like this, very free and spontaneous. I love the line of leg and the deft definition of the muscle. Drawingness is starting to come through and strangely I think the white works with the grey and yellow. 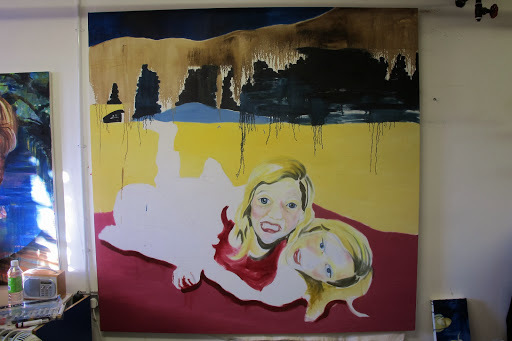 I have introduced some additional lines on the bodies/clothing but haven’t yet made a decision abut how much to add. I like that the faces are more defined as your eye goes straight to them, although I am anxious to not over work them. 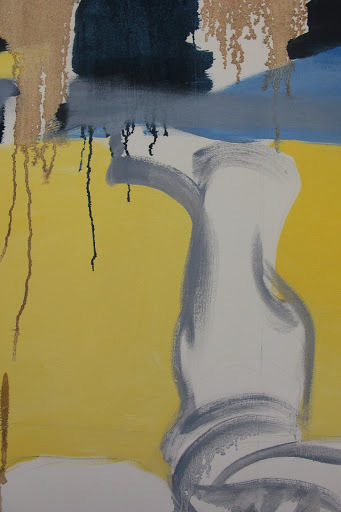 Think the overall colour balance is good so far as it is reiterated throughout the painting. 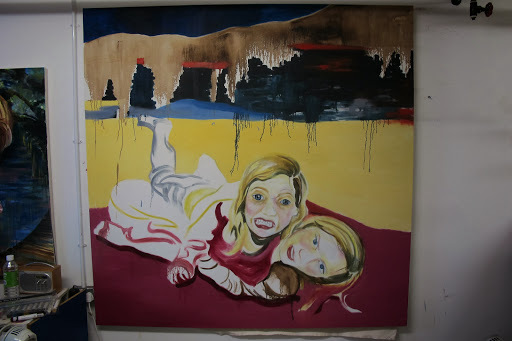 I have painted out quite a large section of the hair (bottom left) with original background colour, leaving a strange residue of the shape that was there – now just a series of marks and stains. So I know I intended to banish green but this felt appropriate as an under painting – very inspired by Simon Ling’s work (see a different post). The right hand figure is a reincarnation of a girl from breaking your boundaries, the left a photo from the previous unit. I wasn’t sure they would work together until I added the background colour and suddenly I felt them bound together, one dwarfing the other reaching down to take her hand. But this could imply an act of kindness, or snatching and leading away. I like how the standing figure has folded herself into the picture space and contorts her body. 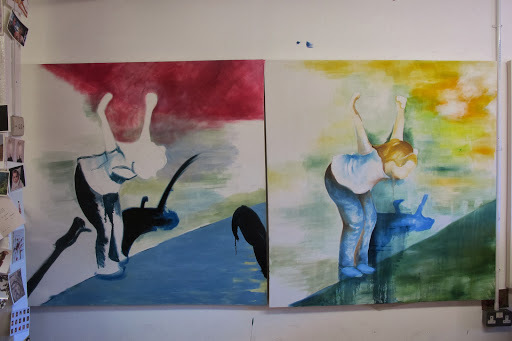 Again I’m aware that working in this way could create a static body but by integrating some background into the figure and by working gesturally I hope that the bodies can move and resettle on the surface if needed. Left hand figure was drawn from right – a mirror and copy. Parallels of diagonals and shadows to introduce multiple figures. Pairs of figures entwined, a mirror image or hybrid twin. A struggle and merge/split as the tangled limbs wrap around each other. A repetition of a previous image or figure, one who has been seen before and may live in the memory of the viewer or artist. 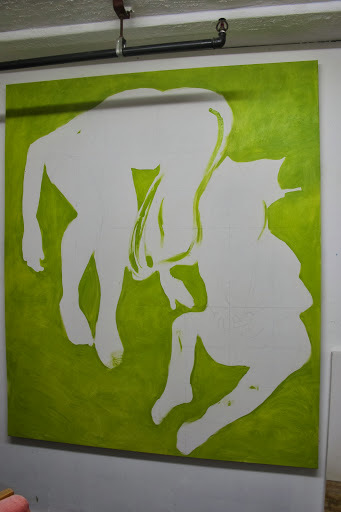 Drawing and line making into the surface of a painting after conception. I am really building on this idea of the two stranded enquiry – this is going to underpin the structure of my essay for the 50/50 option. I have tried to actively document my MA time which is helping me to organize my time and acknowledge when I am spending time on relevant tasks. The bullet points are still key to how my investigation is unfolding, I am going to use imagery like this for the next month or so, so that I am able to sustain the ideas and then edit and refine my outcomes as starting points for the final stage.